Of all the known worlds, of all their nations and all their peoples, there is little rarer than the Helions. Each of these ancient structures is a vast, freestanding portal to other worlds; made by an unknown hand long before humanity arose. Those who control one can claim vast wealth by means of trade and movement through these portals. And on the world of Brisia, it is controlled by the nation of Reimar. Reimar’s wealth and prestige flows from trade, especially cross-world trade through the Helion. But there are signs of an imminent rebellion, especially among the younger members of more distant noble houses, and some rival nations are eager to take advantage of any internal distractions. Princess Siera du Tealdan has shown herself to be a strong and innovative military commander, while her older brother Ramiros enjoys life at the court of their father King Abarron du Tealdan. 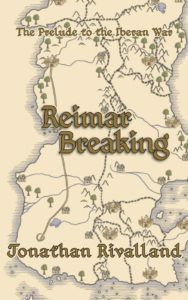 Reimar Breaking, the Prelude to the Iberan War, is the first volume in the Iberan War series.